The main concern about a modern fuel system is that it is high pressure. So if something goes wrong one is spraying fuel all over. Lots of it. So be very careful. The fuel system here is pretty standard, though specific to the spaces in a Europa. The main components are the right-hand fuel tank, a high pressure fuel pump mounted very low, a fuel-rail (for the injectors), and a fuel-pressure regulator for the fuel-return (on the fuel-rail). There is a small fuel filter in the pump inlet (these pumps are not meant to pump any grit at all) and a larger fuel filter (Canton) on the pump output (the high pressure side). The fuel-pressure valve is set to about 3 bar. In June 2013 I replaced all the stainless-braid covered hoses, installing aramid covered hoses from Pegasusautoracing.com. I also moved the fuel filter and cleaned up the fuel line routing so the lines now are pretty much invisible. I will probably have a new tank made in aluminum with a modern top-mount for all the fittings and possibly an in-tank pump. The above picture shows the fuel rail, pressure regulator (right low edge of rail) the fuel injectors, part of the TWM2000 intakes, the fuel inlet (at the left), a peek of the fuel pressure gauge (near left end of ITG air filter) and a peek at the tank fuel-return fitting (just over the ITG air filter at the left). It probably does not matter much which fuel pump you use as long as it develops at least 3 bar (42PSI) of pressure. I bought a Bosch fuel pump which was pretty expensive ($230). In retrospect that was probably overkill, and in fact it was the replacement for the part number I ordered at NAPA, not the original part number. It has worked fine so far. I have a fuel-on-off switch on the dash so I can have the ignition on yet no fuel pump running. Very handy for doing wiring work. The switch controls a relay, the switch does not have to handle full fuel pump amperage. All the high pressure lines have light weight aramid coverings and use AN-6 fittings. I removed the left hand tank entirely in June 2013. I can get along with a single 7 gallon tank. Right now I don't have a working fuel gauge, instead I have a calibrated rod to stick in the righthand tank and check the fuel level. To install the AN-6 fittings (around 2007) I did have to remove the right hand tank and weld on two new steel AN-6 fittings. The original tank outlet became the pump inlet. A new fitting near the bottom became the inlet/outlet for the tank-balancing. A new fitting near the top became the fuel-return tank-inlet. I made an aluminum plate to mount the fuel pump and then mounted the plate to the very thin fiberglass. I thought that was a bit more secure than bolting the pump to the thin fiberglass. 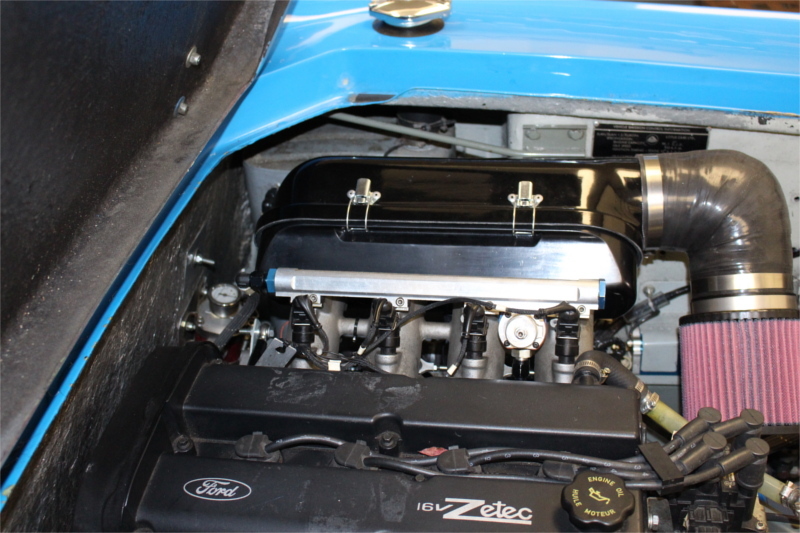 In the following picture we are looking vertically down from the top of the engine compartment toward the fuel pump. 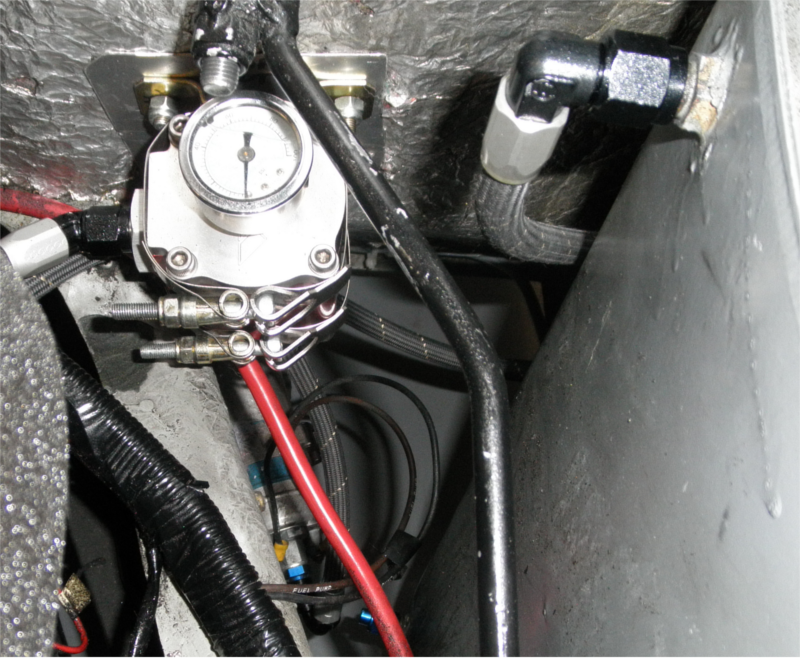 The fuel pump is just to the right of the fiberglass vertical wall and under the red starter wire. 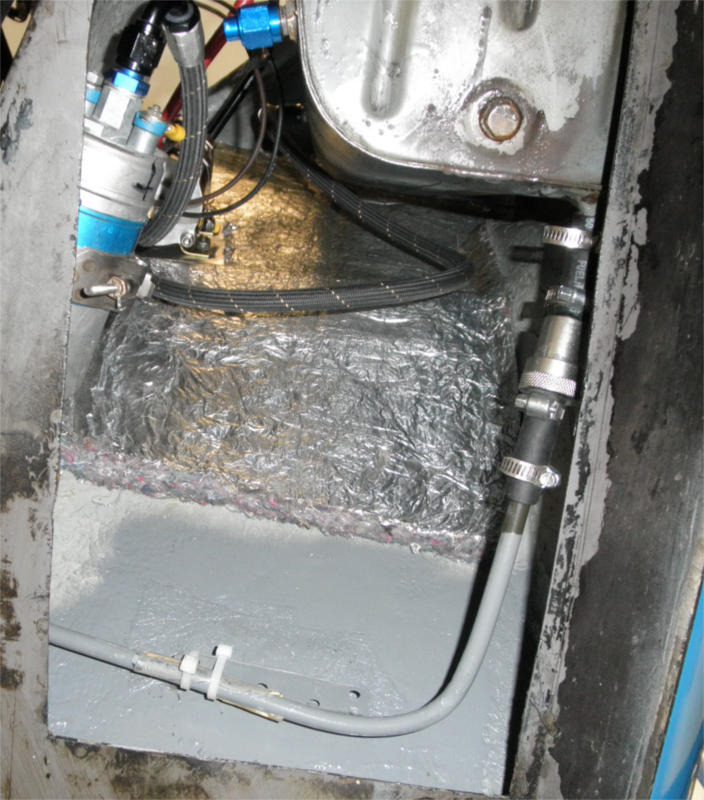 The following picture is taken from underneath the fuel pump and tank. The one fitting (blue) on the tank just seals the fitting that used to lead over to the left-hand fuel tank.